Nebraska is one of six states sectioned by the 100th meridian, that invisible dividing line between the dry western half of the United States and the wetter eastern portion. Signs aren’t needed to determine where it hits in Nebraska either. As in the frontier days, a majority of Nebraskans live in the eastern half of the state while out in the west, bison and cattle roam vast open spaces and yucca-capped buttes remain untouched by modern development. Ultra-productive farming, juicy Omaha steaks, and intensely loyal college football fans may be among the first things that come to mind when outsiders think about Nebraska. 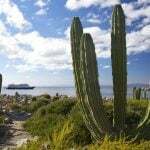 But the state, which is home to business magnate Warren Buffet and Father Flanagan’s benevolent outpost of Boys Town, also stewards landmarks and activities that afford historic peeks into early frontier life and cowboy culture as well as a variety of outdoor adventures for the entire family to enjoy. Let’s get to checking them out! 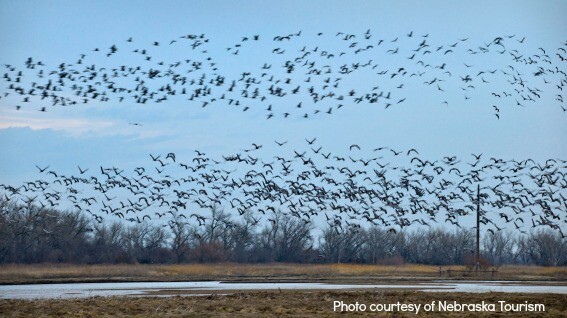 More than 500,000 cranes and millions of snow geese, along with other waterfowl, migrate through Central Nebraska each spring. The Sandhill Cranes alone represent one of the greatest remaining migrations on the planet. Tens of thousands of these large, gray birds, whose wings span 6-8 feet across, can be seen feeding and resting along the Platte River from February through April. This phenomenon culminates in one of the nation’s longest running wildlife festivals, the Audubon’s Nebraska Crane Festival, Environmental education, field trips out to crane blinds, and bird migration stopovers as well as family-friendly activities, are all part of the schedule of this 44-year-old event. You don’t need to wait for a festival to have a fabulous birding experience. Hands-on nature education programs for children, adults, and families, as well as tours and opportunities to learn more about the cranes are available. Visit a crane viewing blind or attend birding field trips or workshops, all offered at the Audubon’s Rowe Sanctuary year round. Have you ever visited the sanctuary and witnessed this migration? Tell us about it!. Cutting through western Nebraska is a corridor dubbed the Fossil Freeway. Saber-toothed cats, ancient 3-toed horses, and barrel-bodied rhinos are among the animal remains that have been unearthed in this hotbed of fossil discovery. Families can get in on the action and do a little digging at the High Plains Homestead during a guided fossil-hunting excursion. Other paleontologist-type adventures include the Hudson-Meng Research and Education Center, home to the largest bison bone bed in the Western Hemisphere, and the Agate Fossil Beds National Monument, the residence of fossilized mammals estimated to be about 19 million years old. Off this highway a bit is Ashfall Fossil Beds State Historical Park, an active dig site in the northeastern part of the state. If you’re lucky, you’ll catch workers in the act of uncovering the fossilized skeletons of animal that died after a volcano erupted in the area about 12 million years ago. 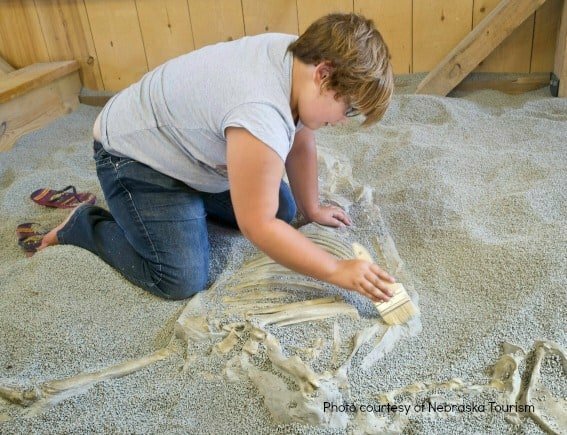 Kids can try their hand at such work at a fossil dig table. Families can also easily hike park trails that include magnificent overlooks. Are you living with a little dino lover? Start planning a trip to the Nebraska Panhandle. Nebraska’s capital city enjoys the youthful vibe of a college town, cool arts, nightlife, and burgeoning food truck scenes, as well as plenty of outdoor fun and historic sites to enjoy. Start by soaking in the sweeping view of Nebraska’s 2nd most populous city from the observation tower at the top of the white stone Art Deco spire of the Nebraska State Capitol Building. Then, check out the elaborate mosaics and artwork detailing the state’s pioneer spirit and history inside the building. The kids will enjoy exploring the Lincoln Children’s Museum. 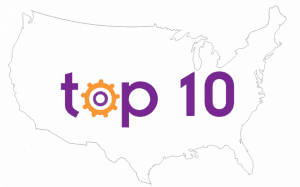 Rated one of the top three children’s museums in the country, all of the activities in this three-story building focus on the power of play. If your youngsters still have energy to burn afterwards, head over to Pioneer Park Nature Center and meander through prairie grass, woodlands and wet lands. Check out a herd of bison, elk, deer, and other wildlife in their natural Nebraska habitats. Dive further into the state’s history at the Nebraska History Museum where the kids can investigate historic artifacts and even pretend they are members of the Lewis and Clark expedition. A visit to the University of Nebraska campus should include the natural history museum at Morrill Hall. The world renowned Nebraska State Museum is chock full of organisms, fossils, and artifacts that interpret the natural and cultural history of the state. 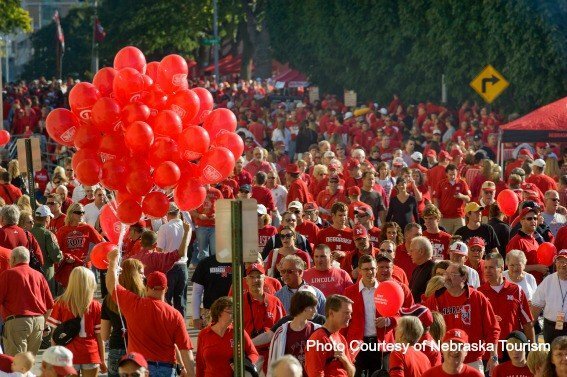 If you’re in the area during football season, get ready for a sea of red to descend on Memorial Stadium and root for University of Nebraska Cornhuskers. The stadium sells out on a regular basis and the crowds, while loud, are known for their warm Midwestern hospitality in welcoming fans from the opposing team. It’s a great place to baptize your little football fans and let them see good sportsmanship in action! Fuel up before you go out and explore! Enjoy delicious goodness like the maple-bacon Long John or the Apple Cinnamon Vanilla cake doughnut at the Doughnut Hole in the Historic Haymarket. It’s difficult for this urban dweller to imagine, but there’s an area out in Nebraska where a near to total lack of light pollution makes for some of the darkest skies in the nation. 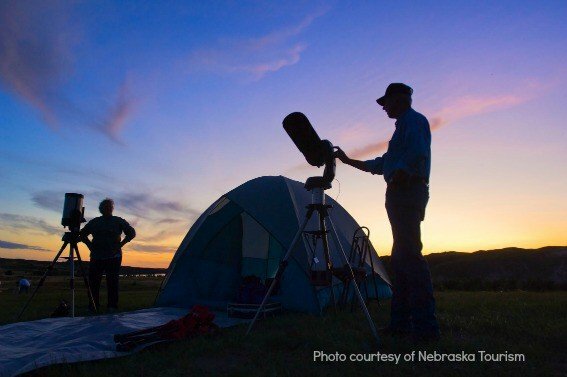 It also draws a major astronomical gathering when the Nebraska Star Party sets up at Merritt Reservoir’s Snake River Campground during late summer. Organized by members of the Omaha Astronomical Society and the Prairie Astronomy Club of Lincoln, party goers bring everything from the largest telescopes to the smallest binoculars to get a good look at the incredible skies. Out in Merritt, the clarity of the starry night sky stretching from horizon to horizon will be difficult to match by any location. Families are welcome to join in the fun, peering through the huge telescopes and taking part in a special kid’s activity program. There is a field school for beginning astronomers, an astrophotography contest, and children’s activities that range from pop bottle rocketry, solar viewing, and crater study to celestial mechanics and astrolabe, planisphere, and telescope construction projects. If camping is not your family’s thing, you can find lodging in nearby Valentine. There are a surprising amount of museums scattered throughout Nebraska. Whether of a historical or more quirky nature, they include the Farm and Ranch Museum, which covers state agricultural history, the Museum of Fur Trade, which traces the 500-year-long story of North American fur trade and the characters whose stories are tied to it, and the Pierce Historical Museum, which is composed of four buildings whose artifacts from the 1800’s include a blacksmith shop, train depot, and schoolhouse. Housed in the original tractor testing laboratory at the University of Nebraska, the Larsen Tractor Test and Power Museum explores the history of farming. Tractors are now tested in the modern-day Tractor Test Laboratory next door. The Museum of Nebraska Major League Baseball covers the sporting careers of over 140 men with ties to the state. The Greenwood Society Historical Depot Museum and the Rock Island Depot Railroad Museum are only two of several places that lay out Nebraska’s long history with the country’s railroads. Then there are those that delve into more modern-day pursuits and interests such as the Strategic Air and Space Museum, the National Museum of Roller Skating and the Museum of American Speed. 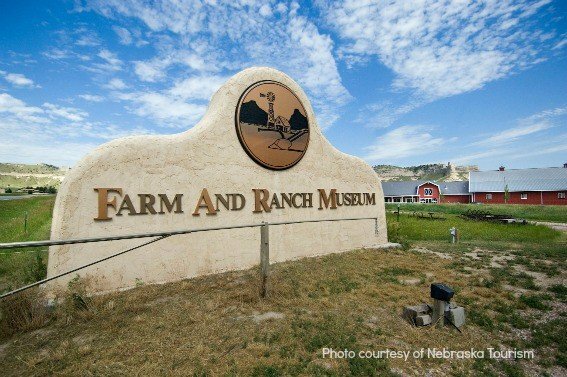 Do you have a favorite museum in Nebraska? Write a review! Nebraska’s largest city, modern-day Omaha, was once best known for its stockyards and massive meatpacking plants. Its central location also made it an important transportation center; today it is home to Union Pacific, the largest US railroad operator. 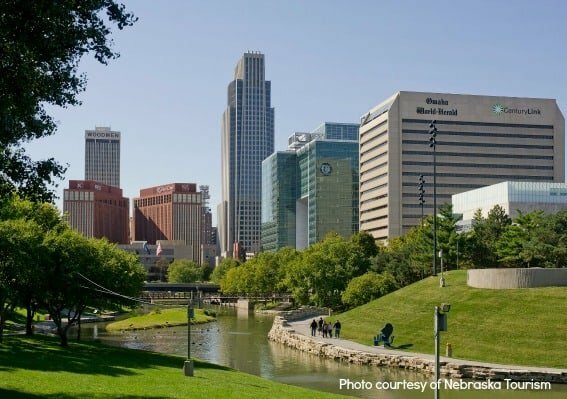 While Omaha has embraced a more cosmopolitan flair in recent years, it is a city still very much in touch with its history and its natural surroundings. Kids will enjoy climbing aboard vintage train cars at the Durham Museum, a former train station, and learning about its importance in the state’s cattle industry. Pioneer history is on full display at the Mormon Trail Center. There are 100 acres of botanical wonder to see at Lauritzen Gardens, which has a surprising neighbor next door, Kenefick Park, another nod to Omaha’s relationship with the railroads. There’s also some jazz history to bone up on at Love’s Jazz and Art Center where Duke Ellington, Count Bassie, and others once played. Moving away from the local history and folklore, the world’s largest indoor desert and rainforests are located at the Henry Doorly Zoo. There are lots of activities to help kids discover how the world works through play at the Omaha Children’s Museum. You can get you youngsters started on an appreciation for masterworks at the Joslyn Art Museum, named one of the 10 best art museums for kids, and take in a performance of the “CHOMARI” Ballet Folklorico Mexicano at El Museo Latino, the Midwest’s first Latino art and history museum. All of that exploring is bound to make you hungry! Hit up the Old Market, an historic area that served as warehouses, wholesale, and retail space in Omaha’s early days. Located in the oldest part of the city, it has been transformed into a shopping, dining, and nightlife destination, and as luck would have it, it is with walking distance of many downtown Omaha hotels! 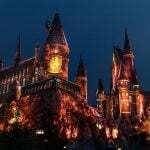 Are you ready to visit? Book your room in Omaha now! 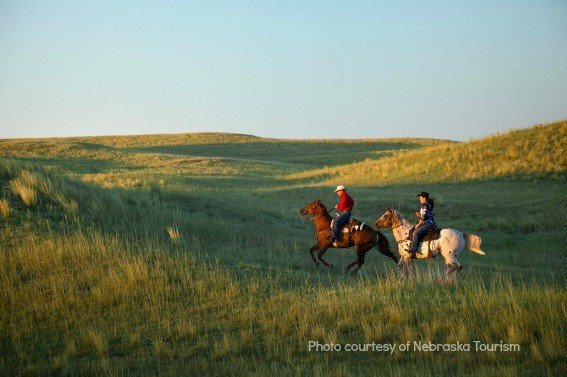 Nebraska offers many opportunities for American history buffs to follow in the footsteps of the great explorers, pioneers, and Plains Indians. Here are only a few of the many time traveling adventures your family could experience. Board a prairie schooner in the Oregon Trail Wagon Train and encounter Pony Express riders and American Indians under the spire of the Chimney Rock National Historic Site. 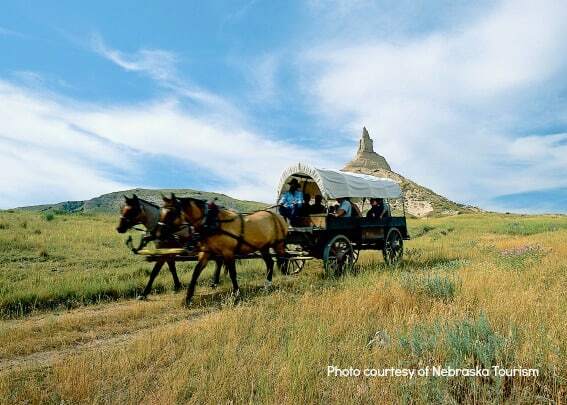 Then get another viewpoint of life along the Oregon Trail through a living history program at the Scotts Bluff National Monument visitor’s center. At the Great Platte River Road Archway, you can chronicle the history of fur trappers, Native Americans, pioneers, and workers who built the country’s first transcontinental railroad as well as adventurists who took to the open road on the nation’s first coast-to-coast highway. The pine-topped bluffs looming over Fort Robinson State Park look basically the same as they did when the Indian Wars were fought there, when Crazy Horse met his death in their shadows, and soldiers trained for battle during World War I. Visitors can take jeep and horseback tours up into the hills and enjoy live entertainment and lodging in the former cavalry quarters. The Homestead National Monument of America dives into the 1862 Homestead Act which granted more than 270 million acres, approximately 10 percent of the United States, to pioneers. Wander onto a Main Street in the 1880s and enjoy a western stage show, a meal at the steakhouse, or quench your thirst in the saloon at the Front Street and Cowboy Museum. Tour the ranch of showman Buffalo Bill Cody and the site of the Bailey Train Yard at Buffalo Bill State Historical Park. It is in this train yard where east met west on Union Pacific’s rail line and workers drove in the golden spike to open up the west. Check out the Lewis and Clark Missouri River Visitor Center and learn more about this duo’s expedition to discover the northwest. Has your family explored Nebraska’s pioneer history? Write a review! With a state park system that stretches from border to border, you don’t have to look far for your next outdoor adventure in Nebraska. Spend a weekend camping at Branched Oak Lake State Recreation Area and enjoy the full gamut of water recreation activities as well as wildlife viewing. Rent a teepee for your stay at Platte River State Park, and admire rock formations and waterfalls as you inner tube or canoe on the Niobrara National Scenic River. Chadron State Park, the oldest holding in Nebraska’s state park system, has a swimming pool, tennis courts, paddle-boats, fishing, archery, and horseback trail rides. Many adventurers take to the Cowboy Trail, between Chadron and Norfolk, enjoying spectacular views while traveling the site’s long bridges. 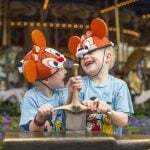 A more unusual water adventure taking hold in many parks is tanking. 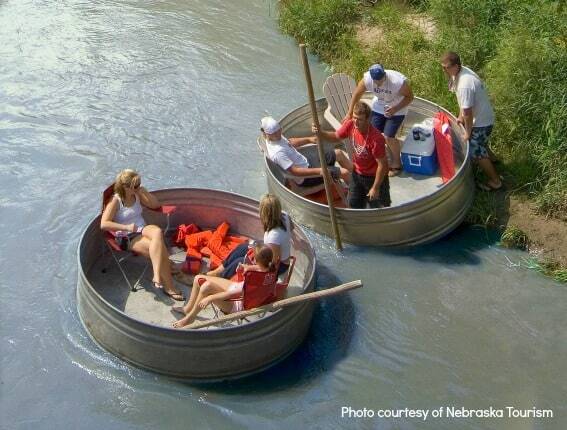 Groups board an eight foot plastic stock tank and a take a casual and social float on one Nebraska’s rivers. These vessels, which can seat six or more, have been found to be more stable in the water than traditional flotation devices, and you can easily get an ice chest full of refreshments in there along with your crew! Wildcat Hills State Recreation Area offers a secluded campground as a hub for taking in the unique landscape of the rugged buttes and canyons south of Gering. Most visitors take advantage of day use activities enjoying the open vistas and ponderosa pine woodlands with a bike ride, hike, or scrumptious picnic. Recreational enjoyment is offered year round at Eugene T. Mahoney State Park with its toboggan runs and large water play park. There’s nature to behold closer to Nebraska’s major cities as well. The 17 miles of walking trails in Bellevue’s Fontenelle Forest act as a peaceful natural haven despite there being almost a million people nearby. Nine miles of trails weave through forests, hilltop prairies, and woodlands at its sister property, Neale Woods. A surprising fact: Though much of the state is devoid of trees, the founder of Arbor Day is from Nebraska. Check out his home and learn how Arbor Day began at Arbor Lodge State Park. The outstanding geological buttes of western Nebraska are not to be missed. 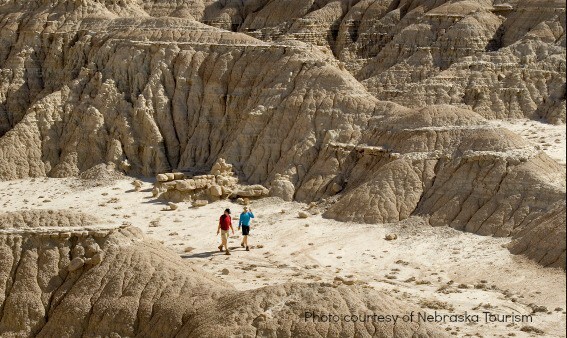 Toadstool Geological Park, located in the state’s northwest corner, will quickly have hikers feeling like they’ve wandered onto a moonscape. These toadstool-shaped sandstone slabs perched on clay stems are the result of the erosion of sediment left by ancient volcanoes. Millions of years of water and wind affects have shaped these spectacular rock formations. The park’s interpretive Toadstool trail is very well marked and a detailed brochure helps visitors make sense of the sites they’re taking in. One of Nebraska’s most famous and well known butte formations made it onto the state’s commemorative quarter. Chimney Rock is a 300-foot spire piercing the sky above the North Platte River. Its unusual shape made it a great landmark for pioneer travelers on the California, Mormon, and Oregon trails. The ruggedly beautiful Courthouse and Jail Rocks got their names from Oregon Trail migrants. The eastern most outliers of the Wildcat Hills, Courthouse Rock is connected to some folklore involving two Indian tribes. The Skidi Pawnees sought shelter from their enemies, the Sioux, here. With cliffs on three sides and one difficult path to the top, the Sioux made camp hoping to wait out their enemies when they gave up from thirst and hunger, only to be foiled when the Pawnees fashioned a long rope, descended the rock, and quietly escaped. Less than an hour away is another site you’ll want to include in your vacation photos. Carhenge may not be a geological wonder, but it is definitely a highly unusual photo opportunity! A replica of Stonehenge, it consists of 38 vintage cars painted gray. While it lacks cultural significance, it is certainly a sight to see out on the Nebraska Highlands. Are you ready for a wondrous adventure? Get started with your plans by booking a room or campsite. 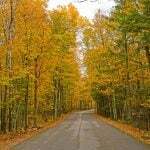 The scenic beauty of the Sandhills region is as surprising as it is beautiful. A large portion of the landscape consists of sand dunes. If you thought sand dunes were something found only in coastal areas, think again. Central Nebraska is actually home to the largest area of sand dunes in the country. Strong winds shaped these hills; precipitation allowed grasslands to take root in the shifting sands and stabilize them. In recent years cattle ranchers have carefully managed the Sandhills, attempting to preserve the stability of the dunes and keep them from reverting back to a desert-like state. Wind your way through small towns, wide-open countryside, rolling hills, and horizons that appear to stretch out forever. Enjoy unique attractions like the Second Wind Ranch, where you can check out the largest collection of standing windmills in the world. Visit over 6,000 feet of honeycombed caverns at the Happy Jack Peak and Chalk Mine, the only publicly accessible chalk room and pillar mine in North America. Visit the Hutchinson Buffalo Ranch and take a covered wagon ride out to see the bison and enjoy canoe or tubing trips. While there is a B&B on site, you could make your stay even more adventurous by reserving a teepee or a sod house for your family. Experience a working cattle ranch at the Arthur Bowring Sandhills Ranch State Historical Park. While you’re there, learn more about ranching in the Sandhills as well as the extraordinary careers of the Bowrings. Arthur was a state legislator and his wife Eve was the first Nebraska woman to enter Congress. Relive the rough and tumble frontier days of the old west at Dobby’s Frontier Town. Visit a bootlegger’s cabin, baled straw house, mercantile, homesteader’s cabin, and so much more in this re-creation of a turn-of-the-century western town. Explore more of the area’s unique terrain at the Valentine National Wildlife Refuge. Sandhill prairies with high dunes and marshy lakes make up a large part of the refuge. The landscape provides great opportunities for viewing sandpipers from the higher grasslands and a variety of wildlife elsewhere. Take care when driving the sandy trails around this refuge. Carrying a water supply and tow rope is highly recommended. 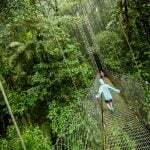 Exploring can sure make you tired, book a place for your family to get some rest.